The sanctuary was built as a scale model of the one in heaven to teach the people lessons of what the heavenly service was all about. All the services and the structure itself were “picture prophecies” of the plan of redemption. In the sanctuary service, there was the daily service which represented our confession and His forgiveness of sin – but then once a year, there was a special service, called the Day of Atonement, where the records were investigated and judgment was passed and the sanctuary was cleansed from all the sins that had been piling up throughout the year. The anti-type of the Day of Atonement in the earthly sanctuary would be when God begins to go through the records in heaven and to cleanse the heavenly sanctuary. Does the Bible tell us when this takes place? So here is a time prophecy whose ending date gives the start of the investigative judgment – but without a starting date, we don’t know when the ending date is. However, at the end of chapter 8, we see that Daniel fainted. Then in the next chapter, we find that the angel comes back to finish explaining the vision, and he gives another time prophecy. The word “determined” in verse 24 literally means “cut off”! The only time prophecy mentioned before this reference is the 2300 days, which must be the time period that the 70 weeks are “cut off” from. That means that the starting date for the 70 weeks is also the starting date for the 2300 days – otherwise, there is no way to locate them. The scripture prophesied in Daniel chapter 2 about the rise and fall of the various kingdoms. Babylon was overcome by Cyrus (Medo-Persia), Medo-Persia was overtaken by Greece-the belly and thighs of brass in 331 B.C [Compare Daniel 8:20,21]. The legs of iron were fulfilled as according to the historian Gibbon “nations or their kings, were successively broken by the iron monarchy of Rome." By looking back at the records of history, we can determine when the commandment to restore and build Jerusalem which begins these time prophecies actually went forth. The decree by Cyrus was only to rebuild the temple. The decree of Darius was to finish the work that was started. The decree of Artaxerxes reestablished the government and legal processes of the Israelite nation. That is why the Bible declares that all three decrees were counted as one – therefore, the starting date for the 2300 days would be when the last of the three decrees have been issued. Using the year 457 B.C. 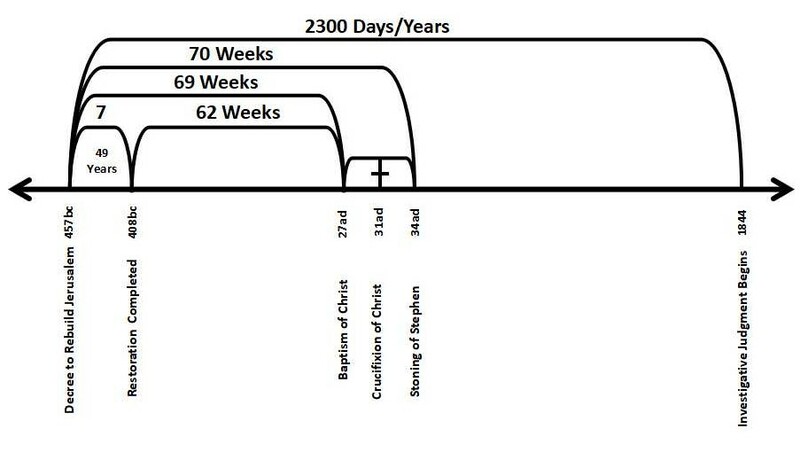 as the starting point for the 70 weeks and the 2300 days/prophetic years – the 70 weeks (490 years) would end in 34 a.d. and the 2300 would extend to the year 1844 a.d. In other words, the 2300 Day time prophecy reaches down to the 19th century and comes to an end in the year 1844. We are now living in the anti-typical Day of Atonement; it is a time of Investigative Judgment. Let us make sure that our sins have all been confessed and forsaken, so that our records can all be wiped clean!